March Madness; A Monument to "Red" Auerbach Boston Celtics one of the most winning coaches ever! The one of the most-winning coaches with the longest history of success in any professional sport, another first for Boston, is shown sitting on a bench in Quincy Marketplace. As an outstanding coach and General Manager he helped bring 15 World Championships to Boston. A member of the Hall of Fame, he has exceeded every record for consistent sports achievement. When measured against all standards of success, Red Auerbach stands alone for directing the Boston Celtics to more championships than any other team in any sport. He has made the name of Boston synonymous with winning. As coach of the Celtics from 1950 to 1966, Auerbach won nine NBA titles, including eight straight from 1959 to 1966 -- the longest consecutive string of championships in the history of North American professional sports. After retiring from coaching, he continued to serve as the general manager or president of the Celtics from 1966 until 1997, and again as president from 2001 until his death in 2006. Prior to joining the Celtics, the Jewish kid from Williamsburg, Brooklyn whose nickname was derived from his fiery hair, earned his stripes as a player at George Washington University (where his season ticket seat is still colored red, contrasting with the blue of the rest of the arena), coached the Washington Capitols to two division titles in 1947 and 1949, briefly coached Duke University, and the Tri-Cities Blackhawks. In 1980 he was named the greatest coach in the history of the NBA by the Professional Basketball Writers Association of America. He was inducted into the International Jewish Sports Hall of Fame in 1979 and the National Jewish Sports Hall of Fame in 1996. He was elected to the Naismith Memorial Basketball Hall of Fame in 1969. Mother of 15 children, herbalist , midwife, theologian and brilliant religious speaker and thinker was shutdown by Governor John Winthrop as well as 13 secular and religious leaders including Rev. John Cotton of the Commonwealth of Massachusetts. In front of the West and East wings of the State House are twentieth century memorials to seventeenth century strong-minded ladies, who grievously disturbed the peace of Boston in their time. Anne Hutchinson (1591-1643), who arrived in Boston in 1634, so vigorously expounded a ‘covenant of grace’ that she was within three years tried for ‘traducing the ministers and their ministry’ and banished from the church and colony. In 1638 she emigrated to Rhode Island, and in 1642 to Pelham Bay in the Bronx, where she was killed by Indians. Charles Bulfinch; Bostons' and Americas' Architect; his bronze monument resides in our Massaschusetts State House. Inside Beacon Hill State House Bronze plaque by Herbert Adams, 1899 Commissioned by the Commonwealth. Bulfinch’s first building was the Hollis Street Church (1788). Among his other early works are a memorial column on Beacon Hill (1789), the first monument to the American Revolution; the Federal Street Theater (1793); the “Tontine Crescent” (built 1793–1794, now demolished), fashioned in part after John Wood’s Royal Crescent; the Old State House in Hartford Connecticut (1796); and the Massachusetts State House (1798). Over the course of ten years, Bulfinch built a remarkable number of private dwellings in the Boston area, including Joseph Barrell’s Pleasant Hill (1793), a series of three houses in Boston for Harrison Gray Otis (1796, 1800, 1806), and the John Phillips House (1804). He built several churches in Boston, of which New North Church (built 1802–1804), currently the Saint Stephens Church, is the last standing. Serving from 1791 to 1795 on Boston board of selectmen, he resigned due to business pressures but returned in 1799. From 1799 to 1817 he was the chairman of Boston’s board of selectmen continuously, and served as a paid Police Superintendent, improving the city’s streets, drains, and lighting. Under his direction, both the infrastructure and civic center of Boston were transformed into a dignified classical style. Bulfinch was responsible for the design of the Boston Common, the remodeling and enlargement of Faneuil Hall (1805), and the construction of India Wharf (1803-1807). In these Boston years he also designed the Massachusetts State Prison (1803); Boylston Market (1810); University Hall for Harvard University (1813–1814); the Meeting House in Lancaster, Massachusetts (1815–17); and the Bulfinch Building of Massachusetts General Hospital (1818), its completion overseen by Alexander Paris, who was working in Bulfinch’s office at the time the architect was summoned to Washington by President Monroe. In the summer of 1817, Bulfinch’s roles as selectman, designer and public official coincided with a visit by President Monroe. The two men were almost constantly in each other’s company for the week-long visit, and a few months later (1818) Monroe appointed Bulfinch the successor to Benjamin Henry Latrobe (1764–1820) as Architect of the Capitol in Washington,D.C. (The Capitol Building had been partially burned by the British in 1814.) In this position he was paid a salary of $2,500 per year plus expenses. As Commissioner of Public Building, Bulfinch completed the Capitol’s wings and central portion, designed the western approach and portico, and constructed the Capitol’s original low wooden dome to his own design (replaced by the present cast-iron dome in the mid-1850s). In 1829 Bulfinch completed the construction of the Capitol, 36 years after its cornerstone was laid. During his interval in Washington, Bulfinch also drew plans for the State House in Augusta, Maine (1829–32). He returned to Boston in 1830, where he died on April 15, 1844, aged 80, and was buried in Kings Chapel Burial Ground in Boston. His tomb was later moved to Mount Auburn in Cambridge, MA. The annual Armenian sculpture reconfiguration and its' meaning to all of us each and every March. The Armenian Heritage Park is a monument having dynamic educational interaction between the people who visit it learning about the genocide of the Armenian people and their Armenian journey to America. The Annual Reconfiguration of the abstract sculpture: the end of March of each calender year. The Abstract Black Metal Sculpture, a split dodecahedron, at Armenian Heritage Park on the Green way is reconfigured in celebration of the immigrant experience. The annual reconfiguration commemorates all who were pulled away from their country of origin and came to these Massachusetts shores reconfiguring their lives in new and different ways, contributing to the richness of the American life and culture. The Labyrinth symbolizes the career avenues the Armenian immigrants have taken to recreate their lives within the Boston area. Art, Sciences, Commerce and Education are the pathways of these tormented peoples in their own homeland in 1925. The fountain in its center, symbolizes hope for the future ceasing of the genocide of Armenian people and any and all future people of this earth. It is cold again in Boston, MA! Our Boston Monuments of Bronze and Stone make us feel it! The above photo is taken from "The Boston USA" Facebook newsfeed. 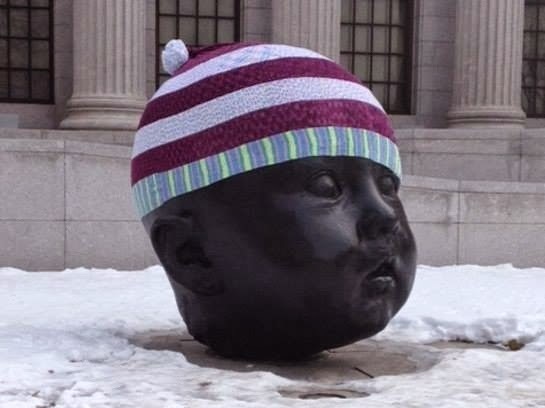 The winter cap made for this modern Spanish Bronze sculpture reflects the sensitivity, frolic and feeling Bostonians have for their public works of art. "Baby Head" or "Night" mirrored by "Day" bronze work, guarding the Fenway entrance of Boston's Museum of Fine Arts, surprises us as we enter the historic MFA. People are continuously interacting with these assessable public art sculptures. The "Day"photo above emits this winters' cold and snowy characterics. Bostonians answer these prolonged wintry days and nights with tasteful humor. "Day" and "Night" by Antonio Lopez Garcia modeled these after his second granddaughter, Cameron. One with eye open and another with eyes closed. As the author of "Boston Bronze and Stone Speak To Us", I truly enjoy this dynamic interaction between our public art monuments and boston's citizenry. I am publishing this article with due respect to Skye Wentworth my former book promoter of "Boston Bronze and Stone Speak To Us" and friend. Sharing this news of another important monument with respect to love and romance is just another example of how important and meaningful an immortal bronze sculpture, such as this one, can touch we mortals. Our hearts can relate with this universal feeling of heart felt gain and loss in our life relationships. Verona was the Italian Renaissance city of the two infamous long blood feuding families in Shakespeare's play "Romeo & Juliet". Although, this statue is constructed with stone plinth and bronze figure, daily emotions flow between tourists and monument. Again here is anoher example of mounments speaking to us. Touching our inner most emotions, feelings and intellect, sculpture speaks and teaches us. Statue of Juliet, created by the Veronese sculptor Nereo Constantini in 1972. 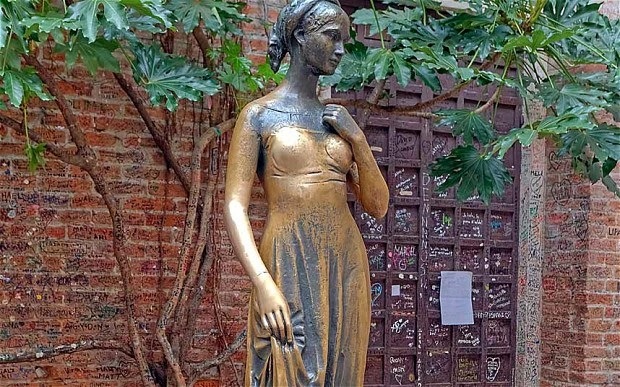 "It, Juliet sculpture, is meant to bring good fortune for those who are unlucky in love, but a tradition of rubbing the right breast of a bronze statue of Juliet has left it looking decidedly the worse for wear. The statue is showing signs of wear and tear, not just from being touched by so many tourists but also because of rain and the effects of the weather,” Erika Righetti, from Verona city council, told The Telegraph." Wall of Love pictured here to the right. 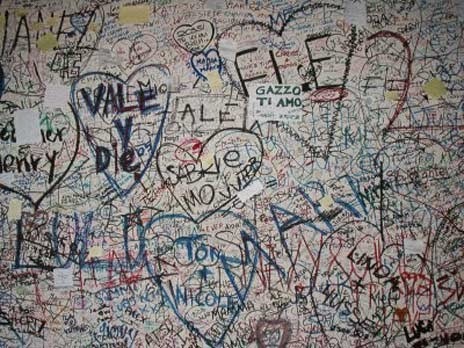 Romantics' signatures from all over the world.